And point guard Tre Jones had his own strong outing, part of Duke's closing act that showed the Blue Devils - with Williamson healthy after missing nearly six full games with a knee sprain - are ready for their NCAA Tournament push. FSU: The Seminoles had been rolling since a 1-4 ACC start in January, winning 14 of 15 games with the only loss coming at third-ranked North Carolina. And they controlled most of the game against the Cavaliers, shooting nearly 57 percent to tear through Virginia's stout defense. 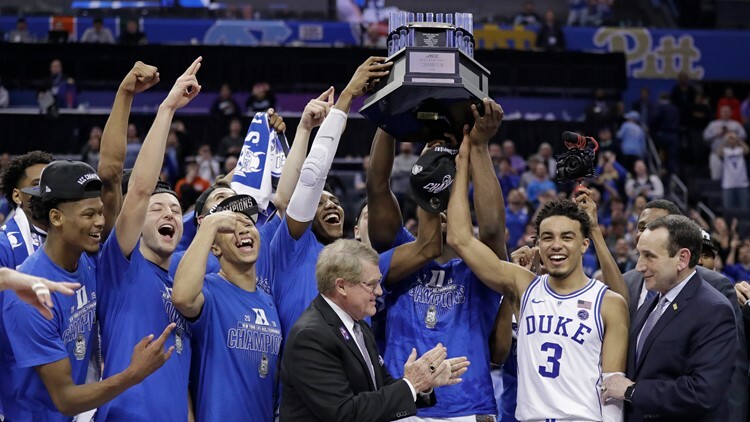 But by Saturday, they managed to stay right with Duke for a half before fading as the Blue Devils made their title-clinching move. FSU made just 8 of 32 shots (25 percent) after halftime as Duke's defensive pressure caused problems, while the Seminoles' defense had trouble getting its own stops as Duke got out in transition more. Duke: This tournament was all about the 6-foot-7, 285-pound Williamson, whose Feb. 20 knee sprain - that included the image of his left foot tearing through the side of his shoe as he fell to the court - had threatened to derail the title potential of a team that has spent a national-best seven weeks at No. 1 in the AP Top 25. But Williamson's return restored that confident edge that reaches throughout Duke's lineup at both ends of the court, from his high-flying dunks to his rim-protecting leaps to swat away shots. FSU: The Seminoles are headed to the NCAA Tournament, where they hope for another deep run like last year's push to within a game of the Final Four.